Fiona Pennie is a British slalom canoeist who has competed in canoe slalom internationally since 1997. Modelled on slalom skiing, competitive Canoe Slalom sees kayakers and canoeists take on a downstream course, in which they have to navigate a series of up to 25 gates, whilst racing against the clock. Competitors have to squeeze through the gates without making contact, as there are penalties for hitting and missing gates. 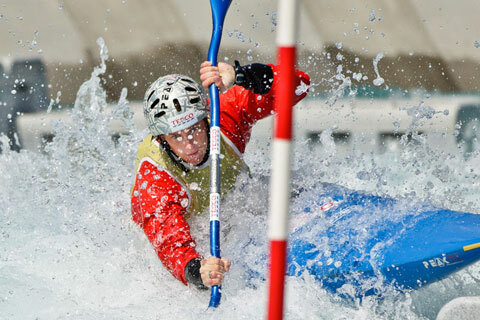 There are four Canoe Slalom divisions in the UK, with entrance level at Division Four. At this level, the courses are generally held on calm water and will be fairly simple. Once at Division One, the courses are complicated and held on very fast, white water. Any kayak or canoe can be used, although more specialised craft are used at the higher competitive levels. Many London clubs practice Canoe Slalom, and it is a great way to keep fit and supple. For more information check out the links below. Two brand new white water courses were built at Lee Valley for the London 2012 Olympics. The Olympic course provides 300 metres of fast, furious, Grade Four water and the smaller Legacy course provides 160m of demanding, Grade Three white water. Both courses are open to the public, but kayakers and canoeists must take a competency test before being allowed to use the courses. The Olympic course is also open for rafting. In a nail-biting finale, Baillie and Stott took Gold for Britain in the C2, just beating the time of Florence and Houslow who took Silver, giving Britain it’s first combined Gold/Silver of the Olympics.